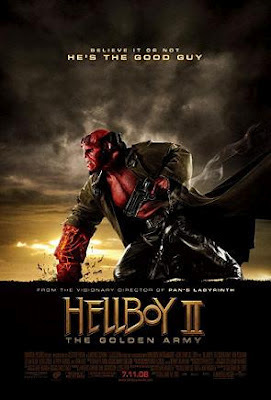 I’d never seen the original Hellboy film from 2004, but after seeing the totally awesome trailer for part II, I became interested and saw it on DVD. Guillermo del Toro’s first Hellboy film was pretty good. He’s a very visionary director, and the film’s small budget limited the scope of the first installment. The action was kind of bland, but the movie is worth watching for the endearing characters. It was a good origin story that was very entertaining, and laid the groundwork for sequels. To say that Hellboy II: The Golden Army is an improvement would be an understatement. The sequel takes the original film, beats it into submission, and throws it in the trash can (and I mean that in the best possible way; the first film was quite enjoyable). Visually, Hellboy II is one of the most astounding creations this year (along with Speed Racer and WALL-E). The films had a much bigger budget, and as such, Guillermo del Toro was able to unleash his visionary prowess. His imagination is limitless, and Hellboy II is proof of that. There are strange creatures around every corner, all of which feel like they could exist in our world. The scene in the Troll Marketplace simply transports the viewer to another world. It’s nothing short of astounding. While the first movie was also quite interesting visually, part 2 makes the visuals of part 1 look pretty lame. The scope of Hellboy II is massive. Not only are there dozens upon dozens of new creatures, the action is a marked improvement. The film has some set pieces to rival any other action scenes I’ve seen all year. They’re creative and thrilling, much better than the first film’s repetitive and stale action sequences. There’s more CGI this time around, but you hardly ever notice it, and it all represents the amazing visual style of del Toro’s imagination. Simply put, the visuals and action sequences will blow your mind. But that’s not all Hellboy II has going for it; visuals alone don’t make a movie worth watching, but characters do, and the film has no shortage of lively, colorful, and above all endearing characters. Leading the pack is Ron Perlman as Hellboy, the big red supernatural-creature fighter. Like in the first movie, Hellboy is the ultimate badass. Perlman is completely natural in the role, showing a flair for one-liners. Hellboy is gruff and tough, but someone you can’t help but love. Selma Blair returns as love interest Liz; in the first film, I though she was a very bland lead, but she’s actually really good in this sequel, proving a great match for Perlman’s Hellboy. Doug Jones returns as freaky fish dude Abe Sapien; Jones didn’t voice the character in the first movie (David Hyde Pearce did) but he does in this film, and I actually like it better. The voice really matches the performance better. Also returning is Jeffery Tambor as Agent Manning, who is constantly annoyed by Hellboy and his friends. The film has a host of new characters, all of which are excellent. The most interesting is Johann Kraus, a German smoke-demon who inhabits a strange humanoid suit. Kraus is voiced by Family Guy’s Seth MacFarlane, who does an excellent job. The character is a hoot, and he and Hellboy’s interactions are priceless. Luke Goss is an effectively creepy villain, playing Prince Nuada. The characters are the best part of the film, and del Toro shows that his talents aren’t limited to visuals; he can create a great cast of rogues too. The first film’s main problem was probably the plot; there was never a real sense of urgency, and the film often plodded along without any direction. Hellboy II fixes all that with an excellent script that keeps the intriguing plot moving at a fast and steady pace. It also sets up some good themes and plot threads for another sequel. In fact, one of the best things that can be said about Hellboy II is that it leaves you wanting more. By the end, I was ready to sign up for part 3. Sadly, we won’t see a third film until 2012 or later, because Guillermo del Toro is directing the two-part Lord of the Rings prequel. Hellboy II doesn’t disappoint, and is extremely enjoyable summer fare. See it in theaters, because the effect will be diminished on DVD.